Josh does most of the grocery shopping now that we have Caleb. It is easier for him to stop at the store on his way home from work than for me to take Caleb during the day. I always give Josh a list of what we need for the week. He does a pretty good job at sticking to list, but sometimes he comes home with “surprise” items like toffee bars, Golden Puffs, or donuts. Well, this week he came home with a good surprise-strawberries. They were on sale and looked really good so he picked up a couple of packages. Good job, honey! 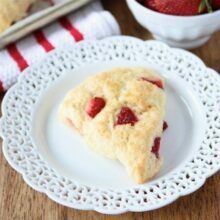 I used some of the strawberries to make Strawberry Ricotta Scones. 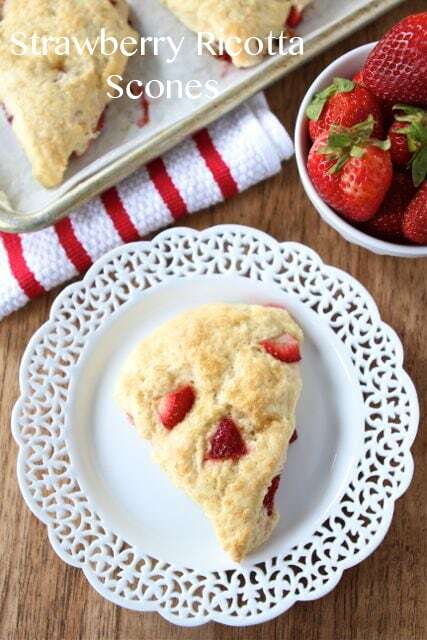 Pick up some strawberries at the market, or have your significant other do the shopping, and make these Strawberry Ricotta Scones. They are the perfect weekend breakfast treat! Have a great weekend everyone! 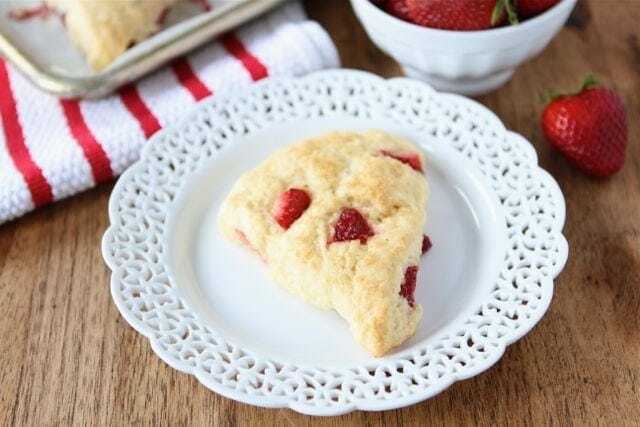 Soft and tender ricotta scones with juicy strawberries! Preheat the oven to 400°F. Line a large baking sheet with parchment paper or a Silpat baking mat and set aside. Whisk together the egg, buttermilk, lemon juice, and vanilla in a medium bowl. Add the ricotta cheese and whisk until combined. There will still be a few lumps. Set aside. In a small bowl, combine the sugar and lemon zest. Rub together with your fingers until fragrant. In another large bowl, whisk together the flour, baking powder, baking soda, salt, and lemon sugar mixture. Add the butter pieces to the flour mixture and toss with a fork just until the butter is coated with flour. Using a pastry cutter, fork, or your hands, cut the butter into the flour until you have a mixture of pea-sized or slightly larger clumps of butter and flour. Pour the liquid ingredients over the dry ingredients and stir with a spatula until just combined. Don’t overmix the dough. Gently fold in the strawberries. Turn out the dough onto a well floured space and gently and shortly knead the dough. If the dough is too sticky, you can add a little bit of flour as you knead. Pat the dough down into a disk, about 1/2 inch thick. Cut the dough into 8 wedges or cut into rounds with a biscuit or cookie cutter. 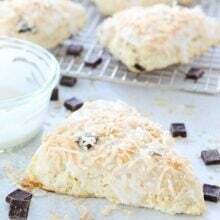 Transfer the scones to the prepared baking sheet and brush with milk or heavy cream. Sprinkle scones with turbinado sugar. Bake for about 15-20 mins, or until the scones are golden brown. Let cool on a wire rack and serve. Note-the dough is sticky due to the ricotta cheese. You might have to add more flour when kneading. Just try to be gentle and not overwork the dough. I love scones… Eating them and baking them both. These look lovely! I can only imagine how delicious these are with the ricotta and lemon. I love that these have ricotta in them…it’s such a delicious cheese! What a nice husband! 😀 Bringing home surprises are always so fun (donuts…smart man)…and strawberries…the best! I’ve been eating a so many! I love this time of year for the fresh produce. Yum! But, these scones look amazing. What a perfect breakfast (or dessert)! I had some fantastic strawberries this week. What a great way to use them! A lovely way to use strawberries, so light and summery! Adding the ricotta was a great idea! I have never made scones and I keep seeing all these great recipes for them. Strawberries ARE a wonderful surprise. These scones look as pretty as they do delicious. Well done! I love sberry scones but I’ve never thought to add ricotta! Looks delicious and I LOVE that white plate! I got them a few years ago at Pier 1! I think they sound great, hubby does the groceries here too, only because I always find things I need. Those do sound delicious! I need to try these! They look just perfect! Strawberry picking here opened recently and I’ve been meaning to go! Josh is amazing. Mine got fired from solo grocery shopping. He kept bringing home too many extras. 🙂 These scones look delicious and I love that you used ricotta cheese. Ricotta is delicious! Our “best” strawberry season is already over 🙁 These look amazing though. I love scones! Fantastic recipe! I love anything with strawberries! Your scones sound delish! I’m totally ready for spring! What a sweetheart for doing the shopping now! And what a sweetheart you are for making these scones! They look delicious! I usually do all of the grocery shopping at our house, but when I do send my husband he tends to come home with surprises too 🙂 Your scones look awesome! Scones are my go to breakfast on the go! Love the addition of ricotta cheese! Fresh strawberries are always a great surprise! I can’t even imagine how delicious these are! So many of my favorites in one!! Definitely exciting to get fresh strawberries! I’m so glad it’s almost summer 🙂 Happy Friday to you, Josh, & Caleb!! Delicious Maria!! these would be perfect for breakfast this weekend! These sound and look fab, Maria!! Using my phone I could see the blog. Cafe website defaulted to mobile site which lists menu only. I tried to go main site but when I clicked on blog, I could taken back to mobile site. Please consider posting the recipe on your website. I don’t have a desktop to look it up again. Thanks! Hi Laura-sorry you had troubles viewing the recipe. I went ahead and added it to our site too! I am so into strawberries and baking with them the past month. These look amazing! 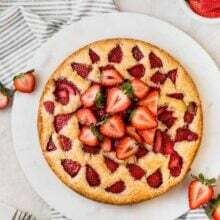 ricotta and strawberries – what a great combo! Strawberries are a fantastic surprise! I’ve always loved scones and these look golden and delicious. I recently tried ricotta cheese in scones for the first time, (recipe is on my blog, using whole wheat flour and blueberries or raspberries) and they turned out so moist and tender! I’ll have to give your recipe a try as well…sounds terrific! I recently had the same thing happen – surprise strawberries showed up at my house! They’re so delicious, and I’m sure these scones were too! I love ricotta in baked goods it just makes them so soft and delicious!! I can’t stand ricotta normally but I do love it in baked goods. It adds just a little something special. I wanna try these! These look so delicious, Maria! Having a scone and a cup of coffee is definitely the perfect way to wake up on a weekend morning. Thanks for sharing! These look so spring-timey good! These are so pretty!! Yum! These look beautiful! Love the combination of lemon and strawberry. A great surprise! These scones look really tempting! I never have trouble coming up with something to do with strawberries. There are too many choices! This looks fantastic! Maybe add a little extra sugar or lemon for flavor if the strawberries are bland. 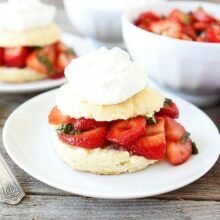 Love strawberries and scones, so I cannot wait to try this recipe. I love scones and these look so pretty. What a neat idea to use ricotta! Any idea if these could be made with frozen strawberries? Maybe slightly thawed? Even thawed they might leave a lovely red swirl 🙂 I always have frozen strawberries, but not always fresh. These look lovely! I haven’t tried them with frozen strawberries. Don’t thaw them too much or they might get too juicy and cause the dough to turn pink and get too watery. I am sure they will work though! That is one super smart husband you’ve got! These scones look like the perfect weekend breakfast treat! This is only the second time I’ve made scones and both times they ended up spreading out into each other on the baking sheet. What am I doing wrong? I think maybe my dough is too warm when I put it in the oven. Maybe I should refrigerate it first? Is your butter cold? It needs to be really cold! Maria-this looks amazing! Great recipe! I can’t send my husband to the grocery store because he comes home with twice as much as was on my list!! These sound so good, though. I’ve had ricotta in cookies before, I bet it’s fantastic in scones! I just made these and they were flat. 🙁 I’ve made lots of scones before with no problems. My ingredients are fresh and I double-checked that I used the correct amounts. What happened?? They usually look beautiful like the picture! Also, my dough was pretty sticky so I had to add quite a bit of extra flour. I couldn’t even really knead it. That might make a difference, right? Where was this recipe when I needed it over the Easter weekend? 🙂 thanks for sharing and enjoy the weekend. I never know what I’m going to end up with when I send my husband to the store…usually lots of junk food! Strawberries are a good surprise, so many uses. These scones look fabulous! 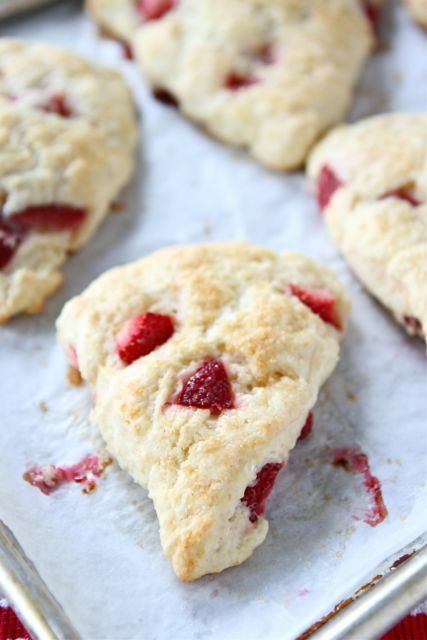 Love these scones all bursting with strawberry greatness! I have baked with ricotta so I know what it can do for cakes. I can’t wait to try these! 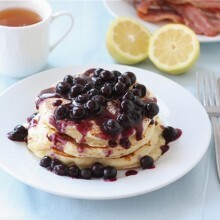 Been on a 2P kick today:) Made these today for the coming weeks breakfast AFTER your ricotta pancakes (a family fav). Made them with lime since we were out of lemon and they have already been ‘sampled’ – ummmmummmm – btw I did have to add a touch more flour. Now off to clean out and maybe nap before making avocado pasta:) for dinner! These are beautiful! I make scones often, but have never used ricotta in them. What a great idea! These look incredibly amazing! Ricotta and strawberry are a wonderful combination. These look absolutely beautiful (and dangerously deeeelicious)! Can you make these the night before and cook in the morning? I haven’t tried making them the night before and baking the morning. They are still tasty the next day. If you do, make sure you refrigerate the dough. Let me know if it works! ENjoy! I made these with whole wheat flour and frozen raspberries (I’m moving in a week and trying to clean out my freezer and fridge) I was wondering what on earth am I going to do with the Ricotta cheese in my fridge?! Then I saw this! Beautiful scones! I bet the ricotta adds the perfect tang and tenderness to these. And really, that plate is gorgeous! Would you mind telling me where you got it? I would love a set! This recipe sounded so yummy! And the are! So the second time I made them I thought of another ingredient that would send these over the top. I added 2 tablespoons of fresh snipped basil. They turned out fantastic! Give it a try! Oh, I wanted to make these so badly! I gathered all of the ingredients and lovingly prepared them, only to have the butter start oozing out and nearly set a fire in the oven! I must have done something wrong. I’m not really a baking expert, so perhaps scones were a bit too complicated of dish to start with? I used 1 stick of butter (which was supposed to be 1/2 cup, as per the wax paper wrapping on the stick). Should I have measured the already cut cold cubes into my 1/2 cup? I hope to hear from someone soon. I was even taking pictures of the process to blog about it on my beauty blog, (because scones and tea are very ladylike). Thank you all in advance. What a yummy recipe! I remade it on my blog and took 2 batches to the workers at my local farmer’s market since they gave me so many extra strawberries. Yum! Made these yesterday for dessert for Valentine’s dinner. Topped them with fresh whip cream and a sliced strawberry and a few blueberries. So yummy and a real hit! Hi – I just discovered this recipe a couple of weekends ago, and it is delicious! My first batch turned out pretty flat and ugly (my kitchen was too warm, i think), but as a result I got the idea to warm them up in the toaster and they are AMAZING all toasted up! For my second batch, I kneaded the dough into a large rectangle and cut them into Pop Tart sized sections before baking. I’ve got them stored in the freezer, so if I need a quick breakfast before work I pop one in the toaster while I make coffee. Seriously the best breakfast treat I’ve ever made!